Kitchen Wall Plaques - 2419 Discounts Apply ! 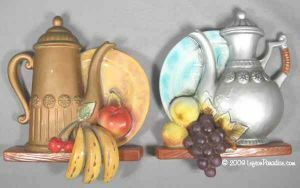 A beautiful pair of kitchen wall plaques depicting coffee service and fruit. These ceramic plaques have no chips or cracks, but there are a few spots of paint loss. They measure 8 inches tall, 7 inches wide and are marked 2419 and have Lefton stickers.